From their Facebook page, they describe themselves in the following way: “Do you seek the raw energy of Death Metal vocals and the soaring synth leads of Darkwave? The cinematic soundscapes of progressive metal married perfectly with the aggression of Deathcore? How about the odd disco beat? TRANCESTATE is all these things and more. 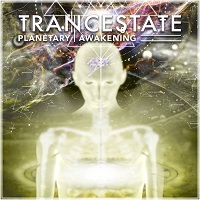 A culmination of multiple styles and influences to create the ultimate aural explosion.” “Planetary Awakening” is the band’s debut release, and contains seven tracks. “Final Curtain” opens the album with deep, roaring vocals and ominous electronica swirling in the background. It moves slowly, so that it may envelop you entirely. It is a very interesting combination indeed. Like Deathcore meets Synth. “Scattered” is a much shorter song, alive with keys and electronic elements and some spoken words that are not entirely audible. It has that soulful and alluring charm to it. “Entheogen” opens with a faster moving pace and when the main riff and vocals drop, it is super-heavy. The rhythms are handled quite adeptly by both the guitars and drums, syncing together in a synergy that is noteworthy. “Nothing will Pacify” opens with some dark and ominous tones. The vocals trade-off from low guttural utterances to high pitched screams, and keys maintain a more steady presence here to my liking. The acoustical passage was both unexpected and gives a twist to the music that is pleasing. It’s not all about the heaviness. “Impact” features Dean Cooke and Jason Groenveld. It has a Djent like rhythm with an absolutely punishing mid-section and just enough electronica to keep it interesting. The clean vocals bring some variation but I am not a fan of them here. “Pandemic” opens with distorted keys that are shortly joined by heavy, thudding guitars. Each strike hits with the intensity of bomb going off. This song has a perfect balance of melody with intensity, something that I appreciate for sure. The guitar work here is very well done. “Destroyer” closes the album. It opens with smooth and mellow keyboard and simulated string notes, sounding a bit Folky. When the vocal and main riff hit, they join in with this melody in a synergy that is well noted. The melody that follows is melancholy and breathes nicely. What follows is a big of the heaviness once again cut by an ambient passage that take it to completion. Overall, this was an excellent album and checks in as described. The Deathcore elements are perhaps most pronounced but supported by the electronica and Darkwave influences as well. The musicianship is very tight, and they obviously pay close attention to their craft. When it’s heavy, it’s heavy as hell, but the more ambient soundscapes keep it varied and interesting.